Let me begin by saying that I really do like the company, Ben and Jerry’s. They have really creative flavours when you compare them to the other big brands. But more importantly, they seem to do some good deeds in the community. Kudos to Ben and Jerry’s. Last night I bought a couple of B&J chocolate fudge brownie ice cream tubs. The ice cream was good, but I couldn’t kept eyeing off the receipt and shaking my head at the price. Surely there’s a better way than spending $4.50 on a 120ml (4oz) tub? For me, that works out to be $4.50/mouthful. Then it suddenly dawned on me. I’ve made a very similar ice cream before. Before I reveal the recipe for homemade Ben and Jerry’s ice cream let’s make a quick comparison of the store bought vs homemade versions. 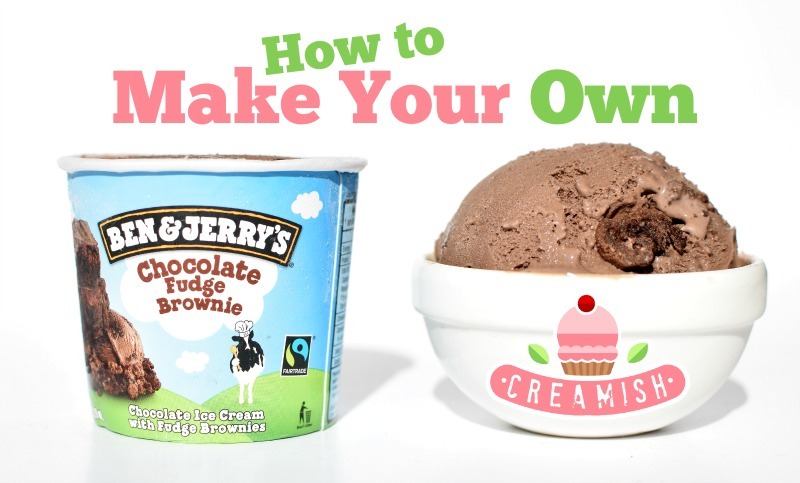 Is homemade Ben and Jerry’s cheaper? I ran some quick numbers and you can see the comparison below. As you’d expect, making it yourself is a lot cheaper. Keep in mind, the B&J price is based on their 120ml tub. This price would reduce a little if you chose a bigger option. A significant difference. Prices are in $AUD. Is the homemade ice cream better? I think the biggest benefit of making your own ice cream is being in control of the ingredients. I stuffed mine with extra large chunks of brownie. You can to. Most people I know love big chunks! When comparing the ice cream, I’d say both options are pretty delicious. They’re creamy, chocolatey and it’s hard to stop eating. I inhaled the 120ml tub of B&J in seconds. That portion size really isn’t big enough for me. A close battle on ice cream taste. How do the ingredients compare? When you make ice cream to sell in stores, it needs to have extra “stuff” added. Otherwise it’ll melt when the shelf-stacker leaves the ice cream in the aisle during a lunch break. Stabilisers allow customers to continue shopping for another hour before taking their ice cream home. But not all ingredients are added to stabilise the product. There are worse brands that B&J on the market, but even the ingredients list below makes me shake my head. When you add water to a product, it’s clearly about reducing cost; water costs less than dairy last time I checked. Homemade ice cream has a lot less added, as you can see from the ingredients lists below. I know which label I prefer. With ice cream, the homemade option will always win. You have two options for the brownies. Either make these yourself or simply buy them from the supermarket. They’ll only set you back a few dollars and they work great. Whisk yolks and sugar in a medium bowl until pale. Set aside. Add cream, milk and cocoa to a medium saucepan and whisk while heating on medium to high. When milk starts to simmer remove from heat. Pour about a cup of the hot milk into the eggs while you whisk at pace. Pour the yolks back into the saucepan of milk and continue heating, stirring occasionally. It’s ready when the milk thickens and coats the back of a spoon. Don’t allow to boil as you’ll cook the yolks. Add milk mixture to an airtight container and refrigerate for at least 3 hours or preferably overnight. Freeze ice cream in your machine as per manufacturer’s instructions. Just before the ice cream has finished churning, toss in the brownie pieces. Pop in freezer until fully hardened. What if you don’t have an ice cream maker? Follow the first 5 steps above and then add it straight to the freezer instead of an ice cream maker. Every 30 minutes remove it from the freezer and beat until smooth. Do this as quickly as possible so that the ice cream doesn’t have time to melt. Every half hour repeat this step for about 3 more times. On the final beating, stir in the brownie pieces. You want to add them as late as possible in the freezing process. Adding them too early will result in the brownie crumbling and the texture of the ice cream won’t be pleasant. No Replies to "Homemade Ben and Jerry's Ice Cream"